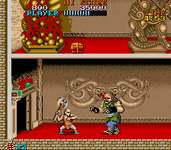 Tiger Road is a coin-op arcade game that was adapted on several computer platforms. The game takes place in ancient China. As Lee Wong, you must rescue the children kidnapped by the evil Ryo Ken Oh and battle his minions along the way. The game is a 2D scolling beat'em up, the player starts with an axe and can pick up better weapons along the way. Enemies include swordsmen, spearmen riding man-sized kites, and big monsters called ogres that can kill the player with one hit. There is also some platform action, especially in later levels where the player enters Ryo Ken Oh's castle.